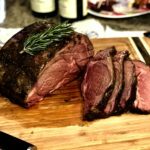 Prime Rib is the pinnacle of holiday dinner and one that can intimidate even the best home cooks. But follow this guide and your house will be know as THE house of prime rib going forward. This recipe is for a 9 pound bone in Prime Rib. Ingredient quantities may vary depending on size. Prime Rib, also known as Standing Rib Roast, is known for being one of the most tender and desired cuts of beef around. You’ll find it at the top of the menu at the nice restaurant you take your spouse to for your anniversary but you never get it. Because it’s so darn expensive! BUT, if you cook it yourself, you’ll get more bang for your buck. Especially if you can get others to chip in for it. The first and most important thing you want to look for in a prime rib is a nice large eye in the middle. A large eye will yield more tender meat that your guests can easily get to. Prime rib is known for being a more fatty cut of meat so any chance you get to make it easier to eat will be appreciated by those partaking. It will cost ore but it will be worth it. 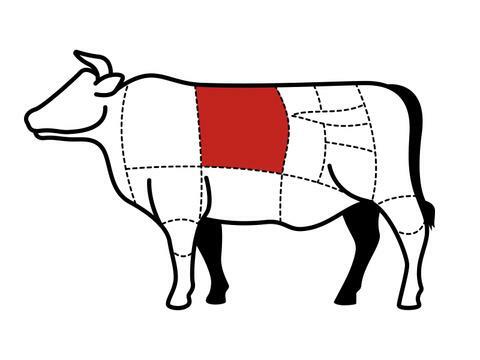 A prime rib should be bone in and have anywhere from two to seven ribs depending on how large you want your roast. The more ribs, the larger the roast and the higher the cost. 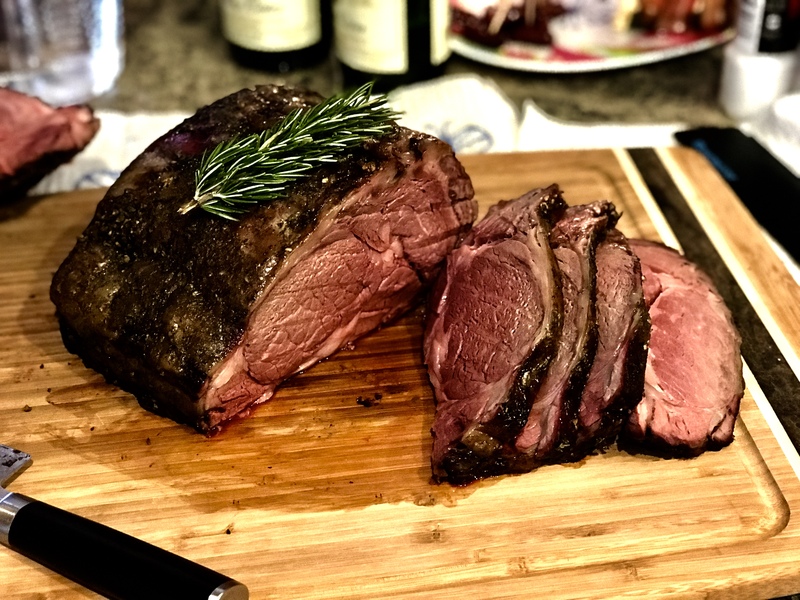 Because Prime Rib is typically a holiday meal you can often find sales just before and just after the holidays so be on the lookout. Anything under $8.99/lb is a good price for a bone in prime rib. Make sure your Prime Rib is completely thawed before preparing. If frozen, place your roast in the refrigerator 3-5 days prior to cooking, depending on the size. Generally the bones will be completely covered by meat and fat. You can leave them as they are but if you’re looking for the aesthetically pleasing roast, trim back about 1-2 inches off the bone and clean them up. In the end, the presentation will be stunning. This is where you’ll want to preheat your smoker to 225 degrees F.
Cover the entire Prime Rib with your herb butter mixture. You can use a spoon or small spatula but I’ve found that using your hands is easier and much quicker. Just make sure you use gloves when you do so. 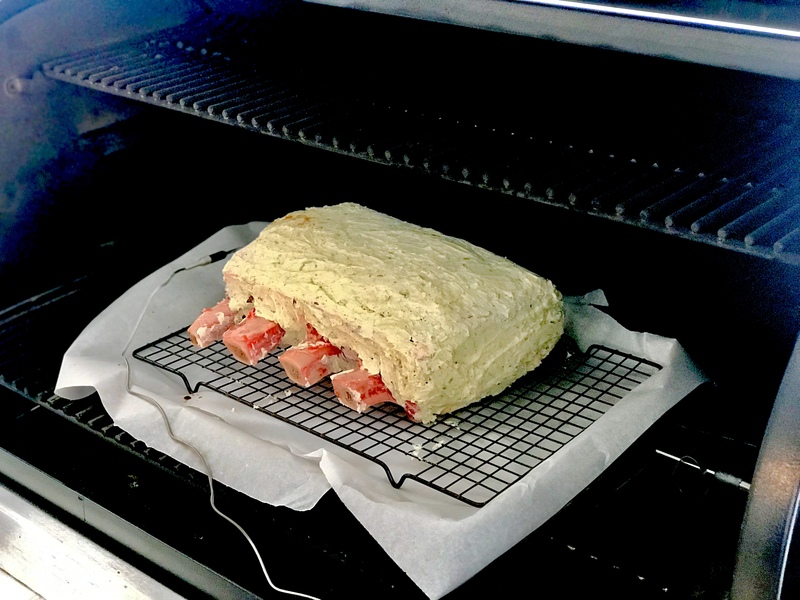 Place your roast on a cooling rack that is on top of parchment paper in a baking sheet. This will allow the butter to be caught and saved for later use. Place your Prime Rib in the 225 degree F smoker and insert an internal probe thermometer into the thickest part of the roast. Use the following time guide to cook your Prime Rib to your preferred temperature. Ambient temperatures may change cook times so be aware of this possibility and trust your probe thermometer. As always, we recommend that you cook all your meat by temperature and NOT by time. This ensures uniformity in results and doneness and minimizes the chances of under cooked or raw meat which can lead to unwanted food illnesses. 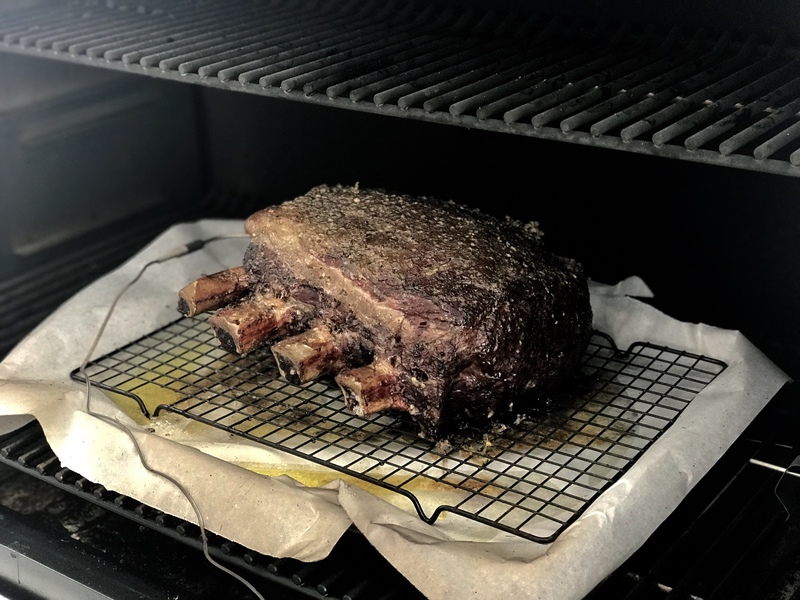 When your Prime Rib reaches 7-10 degrees below the target temperature, pull if from your smoker and let it rest for 15-25 minutes tented under aluminum foil. 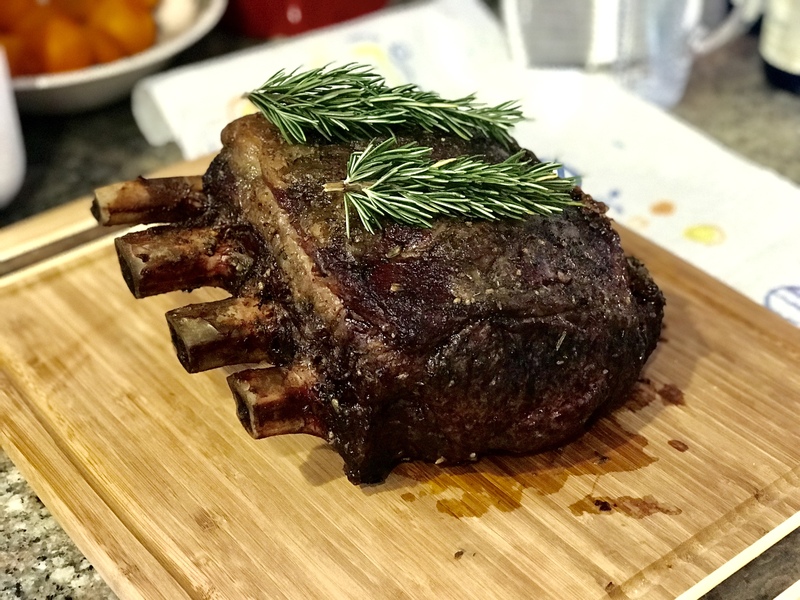 At this time, turn up your smoker or grill to 400 degrees F.
After resting for 15-25 minutes, place your Prime rib on the grill and sear all surfaces of the roast. While doing this, drizzle your butter drippings on your roast. This will provide additional flavor and create a nice crust on the Prime Rib. 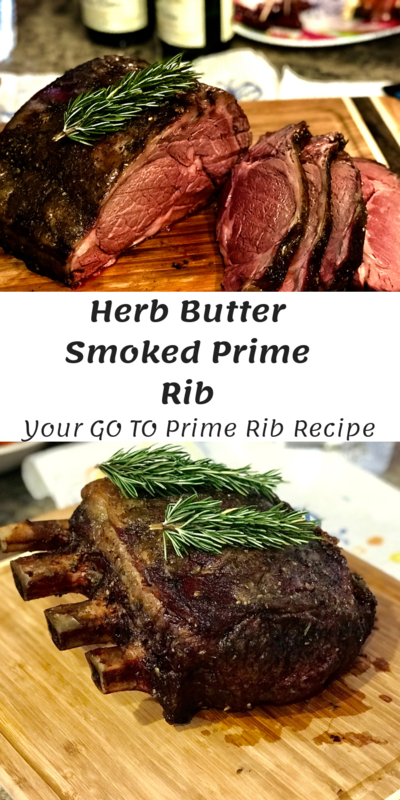 After you’ve seared all sides of the Prime Rib, remove it from the grill and let it rest another 10 minutes before slicing to allow all juices to be reincorporated back into the meat. 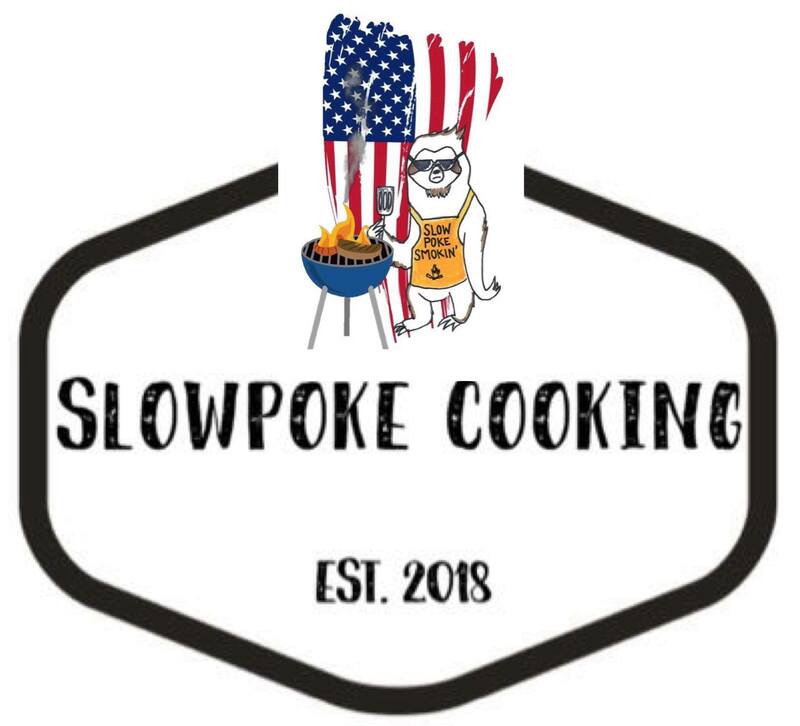 Preheat smoker to 225 degrees F.